Mayor G.T. Bynum shakes hands with one of 32 new U.S. citizens welcomed at a naturalization ceremony Thursday. It was the first ceremony hosted at Tulsa City Hall. Tulsa welcomed 32 new U.S. citizens Thursday in a naturalization ceremony held at city hall. The ceremony was the first one held at city hall, and U.S. Citizenship and Immigration Services said it's the first to be hosted by a city in Oklahoma. Mayor G.T. Bynum welcomed the new citizens and encouraged them to get involved in the community. "It was emotional to get to see folks who have risked so much and been through so much to choose to live here in Tulsa and be American citizens. It was awesome," Bynum said. The new citizens represent 23 countries from all around the world, from nextdoor neighbors Canada and Mexico to the Middle East, from South America to southeast Asia. Nader Dawood’s first relative to arrive in the U.S. was an uncle, a mining engineer who came 45 years ago through an exchange program. Dawood said leaving familiar surroundings in Egypt for the United States himself five years ago was intimidating, and he and his family were worried about the transition at first. "Everybody here was so welcoming, everybody here was amazing, and it’s my home now and this is how I feel. So, it means a lot to me to get naturalized," Dawood said. 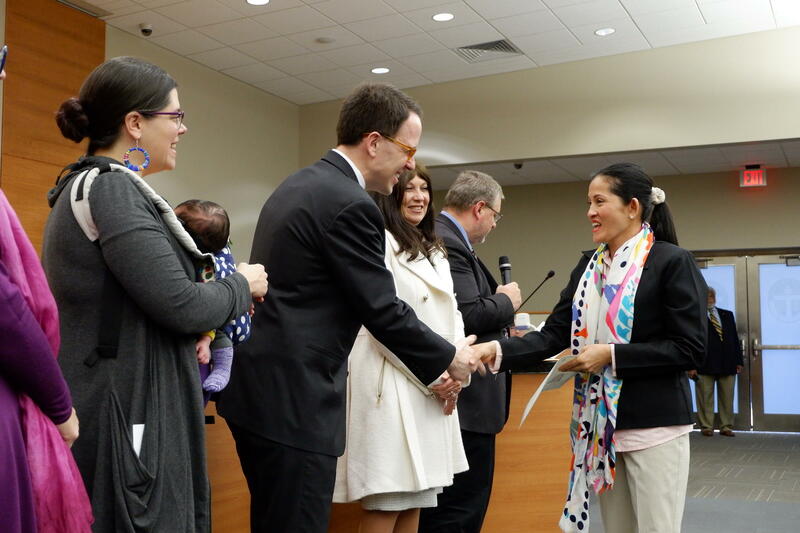 Mayor’s Deputy Chief of Staff Christina da Silva said the city is actively trying to remove barriers to citizenship for its residents, and the naturalization process typically requires them to travel to Oklahoma City twice. "Being able to host the ceremony here in the City of Tulsa not only saves them a trip to Oklahoma City, but it allows an opportunity for their family and friends to be present. So, it just makes the ceremony so much more special, so much more closer to home," da Silva said. The city and Tulsa YWCA secured a grant last year to assist with English classes and legal services required for naturalization.